The newest addition to our Quick Release family is the Wave QR® Fairing – a totally new look in wind protection for Harley-Davidson® motorcycles. It uses the same mount kits as our well-known SwitchBlade® and Spartan® windshields, so riders now have a lot of options, sizes and styles to choose from! * Will not work with OEM or aftermarket spotlight bars. 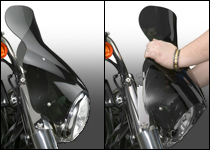 Wave Quick Release Fairings are measured from the headlight cutout in a vertical line level to the top of the shield in the fully raked forward position. Width is measured in a straight line across the back of the shield at its widest point. Have the hottest bike around with National Cycle's Wave QR® – the fairing that defines performance on the edge. 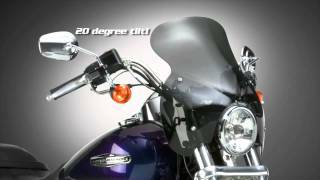 Its precision-formed and sculpted polycarbonate body really captures the road-hungry spirit of your Harley-Davidson® motorcycle. The Wave QR's handy rake adjustability (on most models) lets riders adjust the fairing's rake angle for the look the want or for the wind protection they need. Best of all, it's removable in just seconds, without tools – thanks to National Cycle's Quick Release Mount Kit! The highly regarded Quick Release Mount Kit is the same as used for our SwitchBlade® and Spartan® Windshields, so you not only have a choice between riding with or without a shield – you also have a choice between completely different styles of quick release shields! 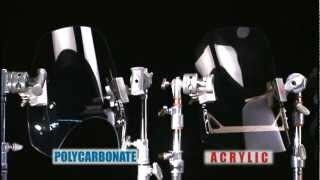 How Do Wave QR® Fairings and Mount Kits Fit Your Bike? 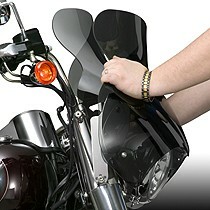 Each Wave QR Fairing and Quick Release Mount Kit is model-specific. These are not "universal" fitments that work fine on some models and work poorly on others. When you order the Mount Kit (sold separately) and any Wave QR Fairing, Spartan® or SwitchBlade® windshield for your model bike, you can be sure it will fit like it was custom made for your bike – because it was! The Wave QR® is made from durable FMR hardcoated polycarbonate with chromed steel and stainless steel hardware. National Cycle's Quick Release Mount Kit is sold separately. See our Products By BIke section for the Mount Kit specific to your model bike.